Dr. Richard Yilin Zhang graduated from Medical School with a M.D. degree in 1986 and completed his residency in Ophthalmology in 1989 in Shandong Medical University with Master degree (M.Med.) in Myopia and Amblyopia treatment and management. Then, Dr. Zhang worked in the affiliated hospital of Shandong Medical University as an Ophthalmologist for many years before he finished his Ph.D in Neuroscience in the Medical School, National University of Singapore in 1995. In 1998, Dr. Zhang received his Doctor of Optometry (O.D.) from The New England College of Optometry in Boston, MA and passed national board and state board (MA and NH) exams to be Board Certified in Treatment and Management of Ocular Disease. He was also trained in the Department of Ophthalmology in Children's Hospital of Harvard Medical School and Lahey Hospital of Tufts Medical School. 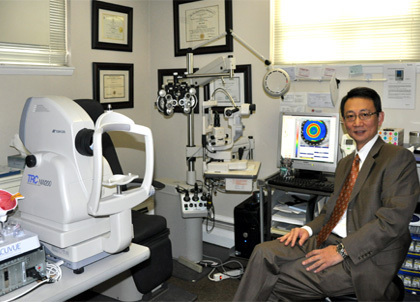 Dr. Richard Yilin Zhang has practiced Optometry in the US since 1998. He provides general optometry services including complete eye exam, contact lens fitting, treatment of eye diseases and eye glasses. With the help of his special training and experience and advanced equipment, Dr. Zhang also provides specialized procedures including specialty contact lens fitting (e.g. bifocal /multifocal contact lens, toric lens, color contact lens and GP lens), Amblyopia treatment for children and dry eye treatment. Dr Zhang is also specialized and certified in fitting Ortho-K/ CRT lens for myopia treatment and progression control (please see Ortho-K and CRT session). Dr. Zhang is also a certified designer for Wave Ortho-K lenses and multifocal lenses. He is an active member of American Academy of Orthokeratology (AAO) and a fellow of Internal Academy of Orthokeratology (FIAO). Dr. Zhang was awarded "The Top optometrist in America in 2009" for his extensive education and training and excellent services. He was awarded again in 2013 for the same title as Ortho-K Specialist. For appointments and questions, please call 781-676-2020 for Lexington office.